I have said it many times, I have the sweet tooth of a 7 year old. My sugar palate never seemed to mature to the dark chocolates of my peers, I have always loved the 100% sugar, fruity varieties of candy that are marketed towards children. For many years, Skittles have been my reigning favorite, a fact that my hubby knows well. Nick will periodically come home after a grocery trip with a share size Skittles bag. When we go see a movie, no questions asked, Skittles are the staple after popcorn. On road trips he will stop for gas, even if we don’t really need it, just to go get me a bag of Skittles. Over the years, not only has Nick stored my favorite candy somewhere in his brain, he has also noted my favorite color combination: purple and red. I don’t know what it is about purple and red, it is the most perfect flavor combination out there. I don’t seek out purples or reds to eat individually, it is a combo deal, otherwise any color will do. I can’t even refer to them as their flavors, because a skittle flavor is unique to it’s color, and trust me, purple and red is it. As Nick and I snuggle up on the sofa to watch TV or sit in a movie theater, he will pass along Skittles to share. Without fail, if he ends up with a handful that has purples and reds, they come straight to me. This is not something I ever made a point to tell him I needed. It was never a discussion, argument, or requirement. It was just something he noticed I liked and did for me unprompted. Moments like these define our marriage. It’s not the buying of houses or birthing of children, it’s the fact that I get every purple and red Skittle Nick comes across. The little things matter the most, because the little things add up to better days, weeks, months, years, and a continued growth together, not apart. The little things mean the other person is still paying attention, wants to know more, and do more to make you happy. Not because you are supposed to buy that house or procreate, they do things to make you happy just because they care enough to want to. It’s scary how well you know me. For this visual journal page, I decided to focus on the colors of the red and purple Skittles. I brainstormed different ways of including them, an avalanche of purples and reds, a Skittles package with nothing but purples and reds, but I ended up deciding that it isn’t the quantity that is important, it’s the combination of a single purple and a single red. Once I decided on just two skittles, I opted to draw hands cradling them, as if they were something delicate and special, not something I am about to chew up and digest. 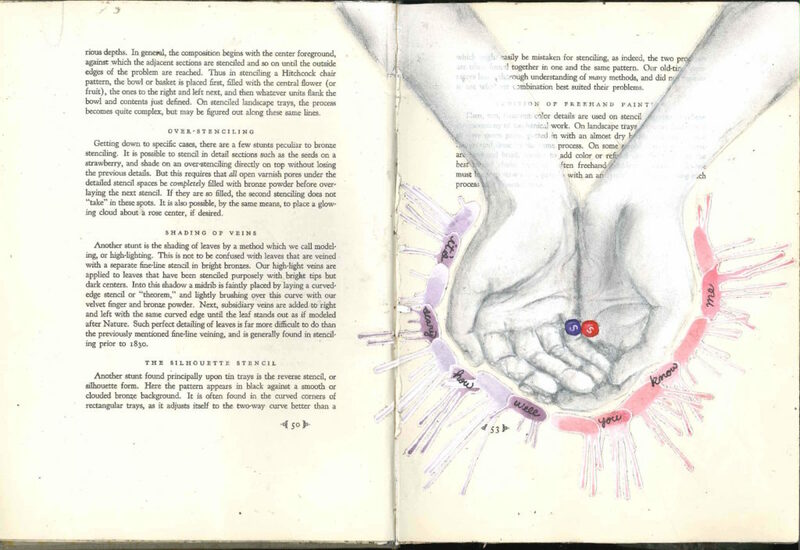 To create the visual journal page, I started by ripping a page from my visual journal book. I did this because I wanted to make the arms and hands stand out against the page and decided to use watered down gesso to do that. Since gesso is liquidy, I didn’t want it to soak through the other pages of my book. I lightly sketched the outline of the arms and hands, then filled them in with gesso. Once dry, I added details and shading with a pencil. Gesso creates a nice, smooth surface to draw on top of. After I finished my hands, on a separate sheet of paper I drew my skittles and filled them in with watercolor. I didn’t add much water to the pigment so I would end up with a nice, vibrant color. While waiting for the Skittles to dry, I moved onto my paint splatters. I added more water to the watercolor pigment, painted a thick line on a sheet of paper, and blew it at an angle to make the paint splatter. After the skittles and paint splatters dried, I cut them out. I glued the skittles down first, then added a highlight and the “S” using a white colored pencil. Next, I alternated red and purple splatters around the hands, and glued them down with rubber cement. Last, I used an extra fine Sharpie to add the words on top of the paint splatters. Dedicate a page to your favorite sweet. This visual journal page is probably my favorite page I have made so far. I am very pleased with how it turned out visually, and although it doesn’t represent the most meaningful moment in my life, it still represents an important memory, a feeling I had and can relive when I look at it. This page represents a road trip to Kiawah Island with my Nick, a long six hour drive, and a sudden harvest moon surprise. We were on our way to a much needed vacation. We were meeting a handful of our friends at one of their parent’s beach house, we were looking forward to the relatively low cost beach vacation and a weekend away from home. After work we ran home, threw our bags in the car, and headed on our way. Friday after work is already a challenging time. I start crashing as soon as I get home from another long week, around 9:00 I’m ready for bed and lam already thinking about sleeping in the next morning. But here we were, ready to hit the 5:00 rush hour traffic, prepping for a 6 hour drive, willing to stick it out for an extra day of vacation. Sometime after the sun went down, a few hours into the drive, the sleep began to hit me. My eyelids felt heavy, my attempts to be a good, entertaining passenger began to dwindle as we feel into sleepy silence. Driving down the windy, two lane country roads there was little civilization, and little light. It was a dark night as we wove through the woods towards the coast. Just as I began nodding off we made our way around a curve, and a massive orange, harvest moon greeted us on the other side. It was a moment that took me by surprise. I wasn’t expecting this beautiful sight, I couldn’t believe how huge the moon looked, and I almost missed it as sleep tugged at my body. We sat in silence admiring the view until another curve took as away and the moon settled behind trees. As we continued our journey the moon continued to follow use, peaking through the forest, from behind buildings, and every now and then showing itself in open spaces. Although the moment came and went, and may seem insignificant, it made an impression on me. It woke me up for the remainder of the drive, and kept me watching the scenery as we continued on. As much fun as we had that weekend the moon is what I most remember. I love that I still have moments of awe, amazement at how beautiful this place is that we live. 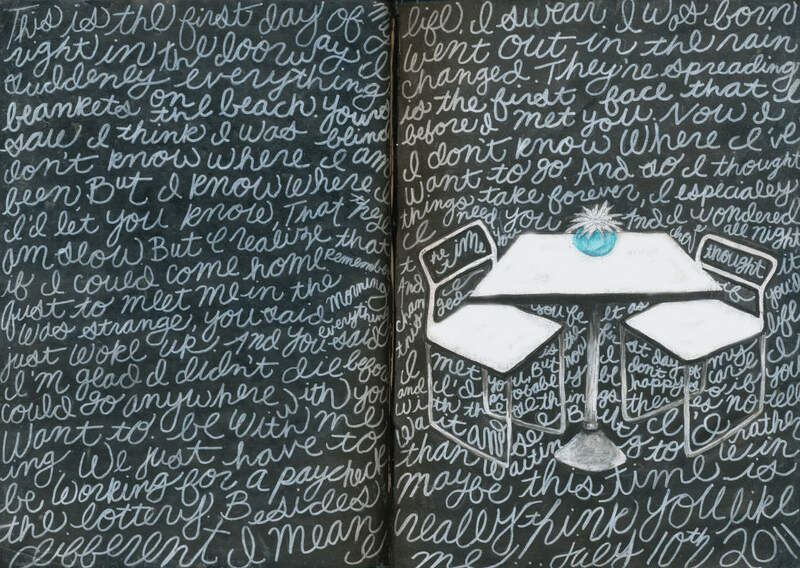 Before I even began making this visual journal page, I already had a plan for it. I knew I wanted a completely black and white page, with only the massive moon in color. I knew I wanted to recreate the scene, the winding road, forest lining on either side, and the moon at the center. I opted to use India ink to create the black foreground and background, since it has such a rich, dark color. India ink is such a liquidy, wet material, it absorbs through everything. Because of this I decided to layer extra book pages together outside of my journal, paint the pages, then glue it into my journal. After I layered the base pages I painted a solid layer of ink for the sky. Although India ink is very dark, it can also be very streaky. As I laid down the ink with my paint brush I made sure I evenly space the lines, and kept it as consistent as possible. After the background dried I took gesso and splattered it over the background to create stars. After the sky was complete I began painting the trees on a different set of book pages, followed by the road. Once they were dry I cut out the trees, glued them down onto the left and right sides of the page, with the cut out road in the middle. I knew I wanted the moon positioned at the end of the road, so I left areas where the trees and road would overlap the moon unglued. I wanted to make sure this moon had almost as much impact as the actual moon I saw. I decided to cut out a circle and layer gesso on top to create a three dimensional look. After a day or two of drying the gessoed moon was finally read to be painted. I began with a light layer of gray watercolor, which settled into the groves and low areas of the gesso. I then layered orange on top. After just two coats of paint, I took a step back and to my surprise I realized the moon was complete. 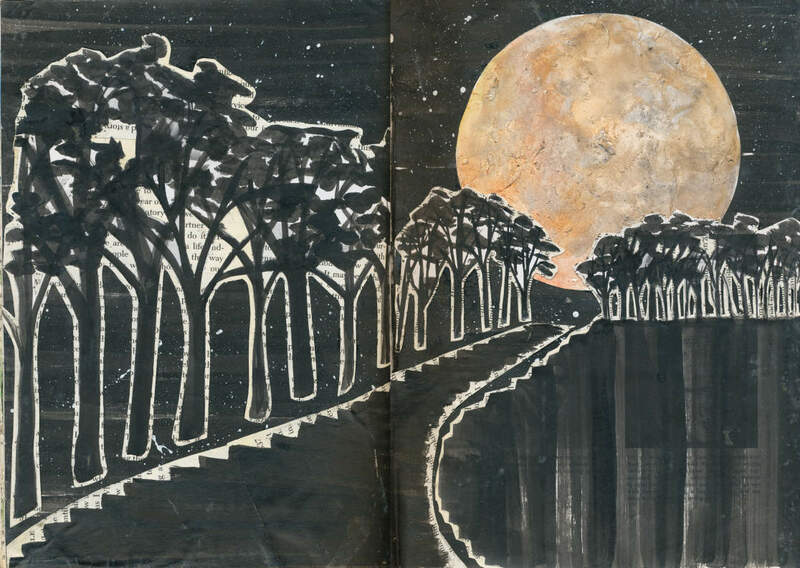 I carefully glued the moon to the background, and glued the remaining edges of the trees and road. My beautiful moon inspired visual journal page was complete. Use thick layers of gesso to create a more three dimensional look on your next page! Thanks for taking the time to check out my blog and harvest moon post! Help me spread the word by sharing with others, I couldn’t do it without you! Hilton Head Island is my second home. When I think back to my childhood many of my memories stem from this small island off the coast of South Carolina. Learning to ride a bike, collecting sea shells, playing games, and as a teenager trekking down to the Marriott to meet boys. Since I can remember my parents have had our house off of Hickory Lane. It was purchased when I was barely walking, and we still own it today. Even though the house is split between good friends and extended family, the 6 weeks we have every year makes it feel like our house. It feels like our home making the 4 1/2 hour drive down familiar interstates and roads, pulling into the driveway, seeing the screened in porch, the gray/blue color of the house. Every moment is nostalgic, with glimpses of past years. What really completes this sentimental feeling is the first walk to the beach. After quickly unloading the car as a family we walk to the beach. Down our street, across Pope Avenue, and finally down the path. Hilton Head is a very bike friendly place. Bike paths parallel streets, wind through trees, and take you anywhere you want to go on the island. The beach consists of compacted sand, unlike the white loose sand of many coasts. The compact sand allows bike trips up and down the shoreline. Because so many beach goers are also beach bike goers the beach paths have to accommodate the bikers; and the houses along our beach path decided strips of discarded carpet was the way to go. Layers upon layers of carpet has been laid on this path for years. Slowly the carpet began creeping from the entrance to the beach all the way to the intersection of Pope Avenue. Covering tree roots, and loose sand blown back from the beach, the carpet does wonders for a bicyclist trying to reach the beach. On our first night I always take a minute as we hit the path and consider how strange it is to have a carpet trail leading us to the beach. The moment we hit the end of the carpet, the beginning of the sand, and crest the final slope allowing us a glimpse of the ocean, I truly feel like I am home. I have come from home number one in the city to home two on the beach. Even though walking down that carpeted path to the beach is leading me away from my house it some how feels like I’m going home. To create this visual journal page I started with a base of layered book pages put together outside of my visual journal. Since I knew I wanted to use watercolor I decided it would be best to paint it on separate paper, then glue it into my journal. By doing this I avoid wrinkly pages and the color accidentally seeping through this journal page and staining others. I used rubber cement to glue the pages together to create a base. I then got out my watercolors and got to work. I wanted to keep it loose, so rather than sketch everything out first, I went for it. I started with the sky and layered blue watercolor. Every now and then I took a paper towel and dabbed area of the sky, pulling the blue paint back up. This is a good technique to create clouds. Next I painted in a slightly darker blue for the ocean, followed by green lines for the tall grass. I decided to leave the path unpainted, letting the color of the pages in the background define it. After I had my base painting down I went back in with gray to create shadows in the grass, and yellow to create the tops of the sea oats. I then used India ink to better define areas. I painted a loose line between the ocean and the sky, and used short, wiggly lines to bring out the shoreline and waves. I randomly scattered black lines in the grass and outlined the tops of the sea oats to create shadows. After the background was complete it was time to add the words. I wrote them out with pencil first, then outlined them with a black colored pencil. They looked a little too plain, so I outlined them with a yellow colored pencil that matched the yellow in the sea oats. 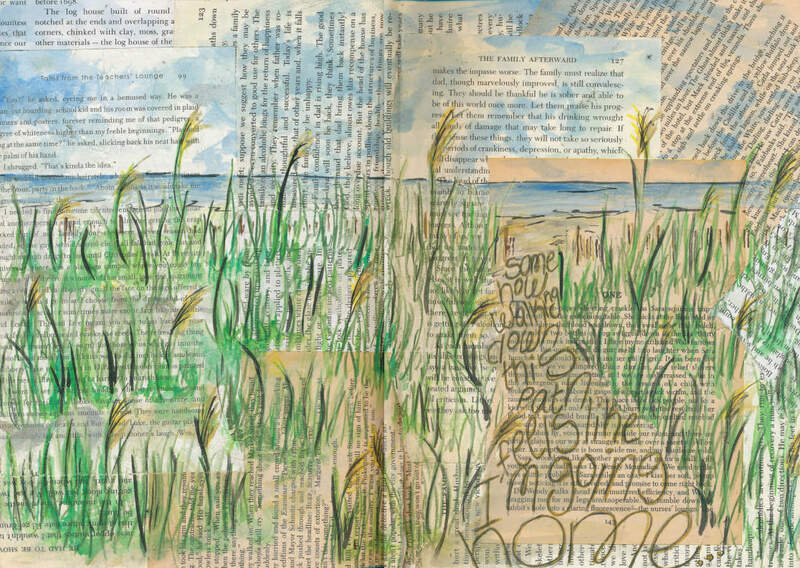 Create a visual journal page about your nostalgic childhood vacation spot or home. Thanks for taking the time to check out my blog and read today’s post! Help me spread the word about my blog by sharing with others. Thanks for stopping by!